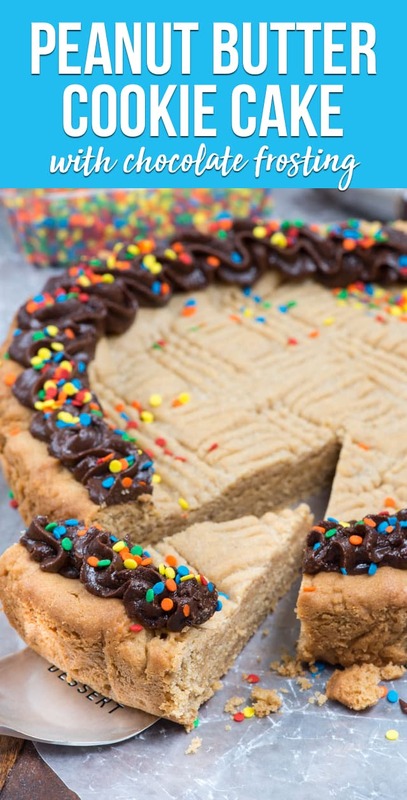 EASY Peanut Butter Cookie Cake is a giant peanut butter cookie! My husband loved this cake for his birthday. Sometimes you feel like a peanut butter cookie…but you want a peanut butter cake too. 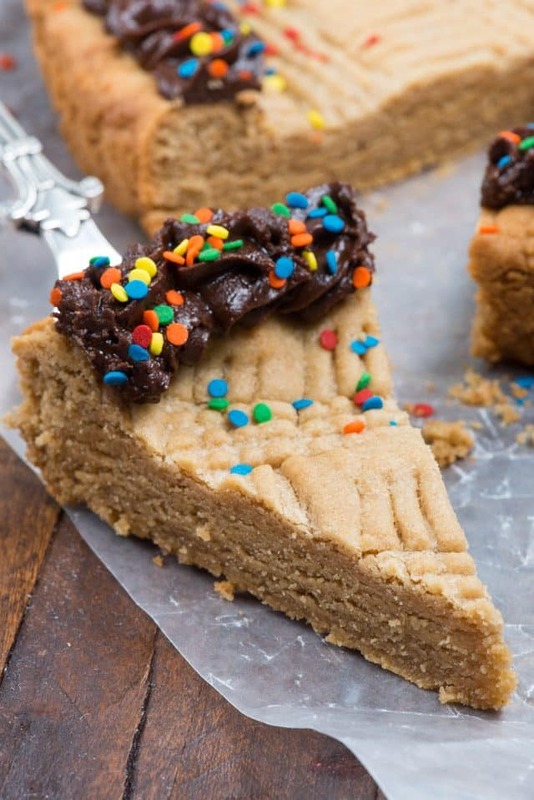 This cookie cake is the perfect combination. Monday was my husband’s birthday. He probably wouldn’t appreciate if I spilled his age but he’s double-digits older than I am and I’m 40 so…you can do some estimation. We’ve had a challenging summer, as some of you may know from reading my newsletter. He had his hip replaced early in June and he’s still in the recovery period: no driving, has to use a walker. He had to work (from home) on his birthday, so we didn’t do anything spectacular, but we did go for dinner and I surprised him with a weekend in San Francisco once he gets the green light to be a normal person again. His absolute favorite are peanut butter cookies. I decided to make my favorite peanut butter cookie recipe into a cookie cake, which, if I’m being honest, is my favorite kind of cake too. A cookie cake is the best of both worlds: it’s a giant cookie that’s topped with frosting, like a cake! Because this peanut butter cookie cake is so thick, it’s soft and chewy at the same time. It’s full of rich peanut butter flavor and I added a rich fudge frosting around the outside. Chocolate and peanut butter are totally BFFs, especially where Mel is concerned. This giant peanut butter cookie recipe starts with all the normal peanut butter cookie ingredients and is baked in a cake pan. Sure, you can make this as a 9×13-inch cake as well, but I love making round cookie cakes. I’ll never forget walking around the mall as a kid and seeing the cookie cakes at Mrs. Field’s. I always wanted one of those! This is even better, because it’s homemade with my favorite recipe EVER. 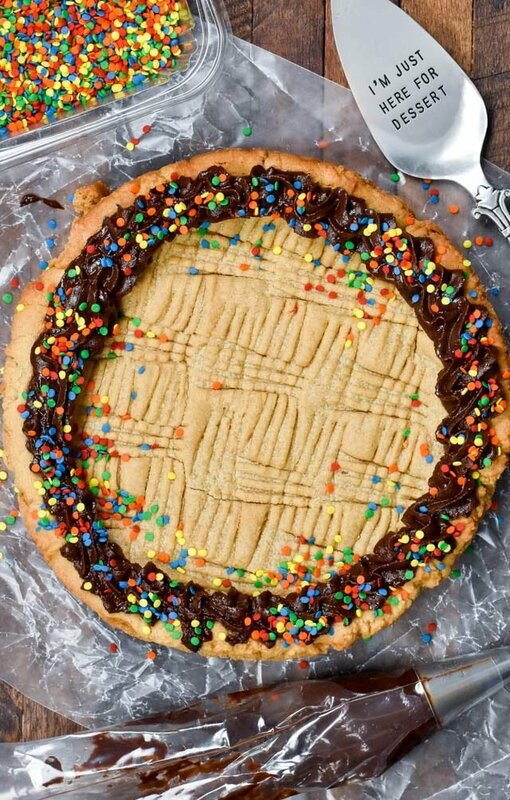 How do you make a peanut butter cookie cake? 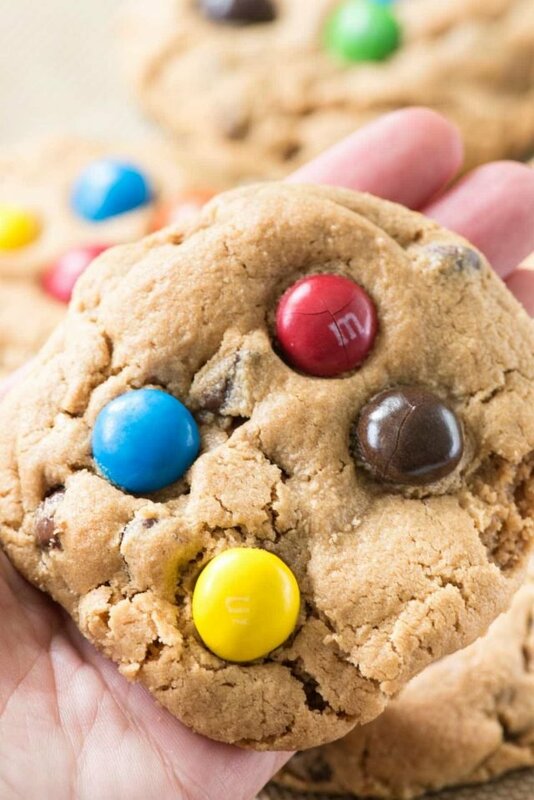 It’s as easy as making peanut butter cookies. Simply mix up your dough and press it into a cake pan. Bonus: no scooping or chilling needed! This is the same recipe I’ve made so many peanut butter cookies with: stuffed with Snickers and Oreos, or turned into caramel bars. 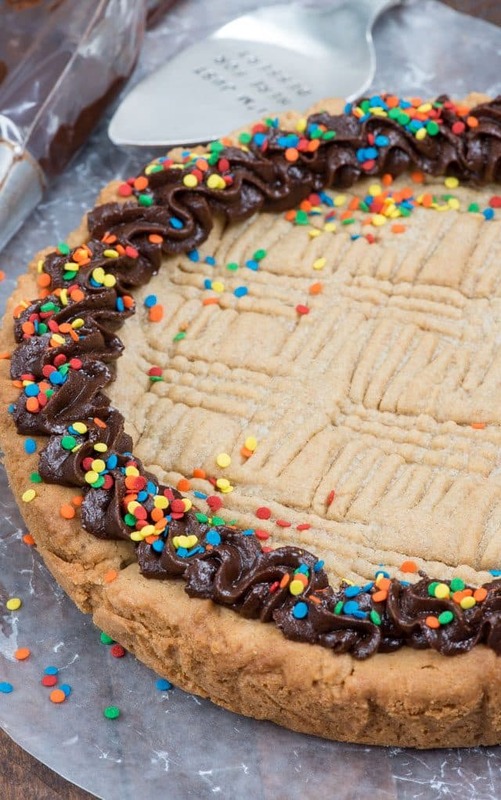 What kind of frosting goes best on a peanut butter cookie cake? Really, any kind of frosting goes, but I love this fudgy chocolate one. It’s the same one I use on my chocolate cake; it starts with melted butter and is super rich and chocolatey. Don’t over bake this. Err on the side of underdone, just once it’s golden brown around the edges. Skip the frosting if you want, or fill the cookie cake with chocolate chips or Reese’s Peanut Butter Cups. You don’t have to do the criss-cross marks but I like adding them to make it known what kind of cookie it is. 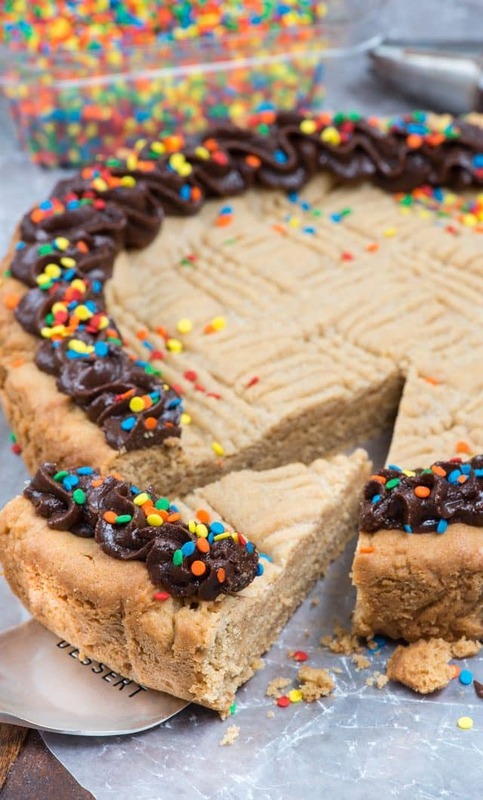 Peanut Butter Cookie Cake is a giant peanut butter cookie with chocolate frosting. Preheat oven to 350°F. Line a 9-inch round cake pan with foil and spray with nonstick cooking spray. Press batter into prepared pan. Use a fork to create criss-cross marks all over the top. Bake for 15-20 minutes or just until golden brown. Cool completely. Make frosting: whisk butter, cocoa, powdered sugar, salt, and 1 tablespoon milk until smooth, adding a bit more milk as needed for consistency. Place frosting immediately in piping bag and frost immediately, top with sprinkles. Store loosely covered for up to 2 days, longer in refrigerator. Love cookie cakes? Check out Lindsay’s Chocolate Chip Cookie Cake, Cheryl’s Birthday Sugar Cookie Cake, or Tanya’s Frosted Sugar Cookie Bundt Cake. Peanut Butter Surprise Cookie are full of caramel. 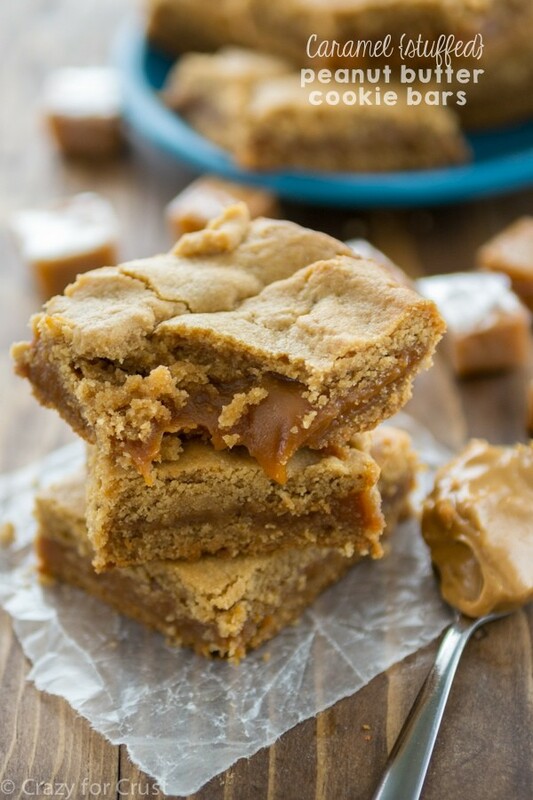 Caramel Stuffed Peanut Butter Cookie Bars are full of caramel too! 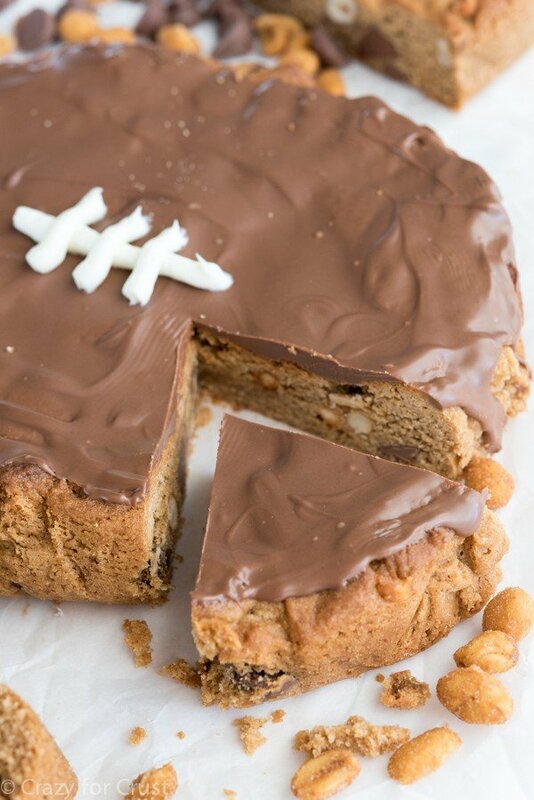 Football Cookie Cake is peanut butter too! Happy belated birthday, Mel! I have been thinking about you guys and hoping you’re hanging in there after the surgery. Hopefully you can get that green light soon to enjoy your SF weekend! I want to sink my teeth into that cookie cake right now! Definitely will try this one! This looks delicious! I totally agree that a cookie cake is the best cake! Wishing your hubby a happy birthday and fun together as a family! I just made this and i forgot the chocolate chips! I was following the recipe and since it doesn’t call for chips I TOTALLY bypassed it, I’m SO mad! Well I’ll have to remember the next time. At least there will be fudge frosting. I’m waiting for it to cool. I’ll post a pic when it’s complete…ugh. Great recipe! Made it for my daughters 21st birthday inna 9 x 13 glass dish! It was a big hit!